Dana Cambon at Luke Brown Yachts sends news of a further $200,000 price drop on his listing for sale, the 26m long-range motor yacht Fortaleza. Fortaleza was built by Inace in 2004, and her rugged expedition-style exterior disguises a luxurious rich cherry wood interior with accommodation for 10 guests in four staterooms including a large master suite on the main deck. 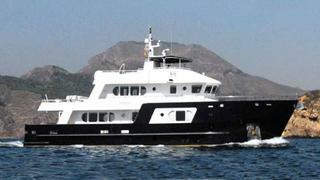 Fortaleza had a major refit in 2007, including new Scania main engines, which give her a range of 4,000 nautical miles. Under her current owners she operated as part of a successful marine archeology and exploration charter business and incorporates state-of-the-art ocean research and survey equipment. Fortaleza is now down to $2,750,000 and can be viewed in Fort Lauderdale, Florida, where she will remain until sold.